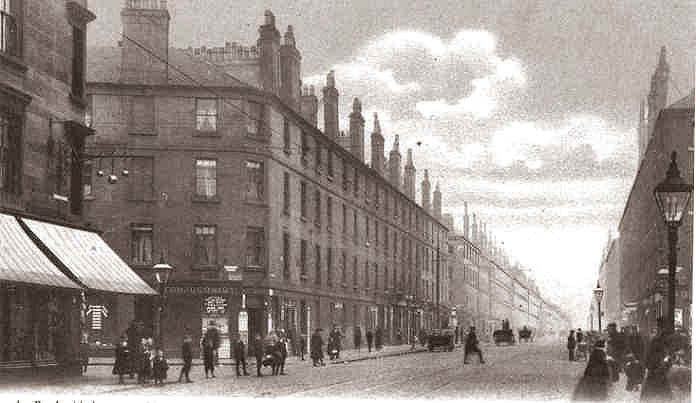 "Although this photograph is from the early 1900s, there was little or nae change when I frequented the area as a youngster in the late fifties. I remember well the post office at the corner of Fordneuk Street (where up above lived the Watson family) and the pawn shop on the other side of the road where we would look with admiration at the second haun watches...even though I coulnae yet tell the time. And if you remember the wee Geggie (or the Premier as the illuminated sign stated) was just roon the corner. And at the other side of the road was The Green Horn pub (was there military connections to this name? ), and a wee bit further alang was the recycled bottling store in Rimsdale Street. And nearer towards the 'Toll' was 'Matha Bones' the undertaker, and then Kilps the bike shop, wae a wee clock repairers next door which had a clock above the door which underneath stated - 'watch clock and case repair' which confused me somewhat, as I thought it meant - watch clock 'in case' repair.....silly me. And of course nearby tae this was the famous (or infamous) Brigton Public Halls where each Seturday night Jimmy Barnes would be belting oot Rock n Roll, and where Lulu started her showbusiness career I believe Jamie is still daen' the rounds, and good for him. I hear also the Lulu is still making a living fae singing. good for her anaw." "....Aye like my good pal Ronnie I also have fond memories of this London Road / Fordneuk Street junction. My Granny Agnes Lavery lived in Forrest Street in the 1960s and I used tae walk from my hoose in 74 Fairbairn Street up Baltic Street intae Queen Mary Street then cross the London Rd intae Fordneuk Street then up tae 28 Forrest St tae visit mah Granny & Granda ( the blue dots ). 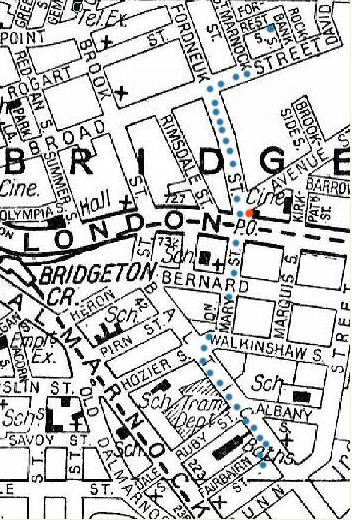 The Post Office is shown on the map by the red dot and as Ronnie says across the road in Fordneuk St. was the pawn shop. The shop on the left with the sun-blinds out was a clothes/hosiery stop in my day and the No.64 bus stop was outside it. Across fae the clothes shop was a fruit shop and newsagent/sweetie shop. Opposite the Post Office was Queen Mary Street where of course is the St Francis-in-the-East Church and the wee school ah went tae Queen Mary Street Primary school, interestingly I only spent 1st year at this school before moving tae Dalmarnock Primary, which everyone did. The Post Office location in the photo below has a large boulder engraved 'Mile-end' on it "
Hello Webmaister. How delightful to happen on this website. I lived in 28 Forrest Street, Glasgow S.E. (as the postcode was then) between the years of 1943 and 1955. I attended Annfield Public School situated in Cubie Street from 1948 to 1955 when my family 'migrated ' to Netherburn, some 17 miles South of 'The Dear Green Place'. I attended Sunday School in Bridgeton Baptist Church during the above years. It would be interesting to know if anyone out there can relate to this area and if they remember me. My maiden name was Morag McRae. I am sorry to say this is the same location. London Road with the junction of Fordneuk Street on the left. The tenements and shops have been demolished, no landmarks left from the photo above. Beyond the trees is the new Police Station, with Helenvale St High rise flats in the distance at Springfield Rd junction. 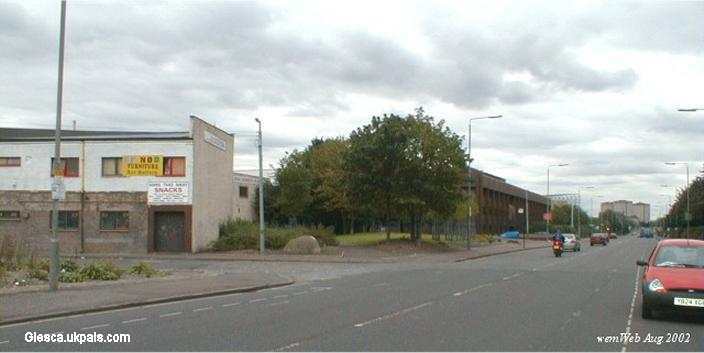 Templeton carpet factory and later a Glasgow Corporation bus depot were in Fordneuk Street, both closed. Opposite Fordnuek Street on the London Road is Queen Mary St, just behind the red car.